In this article we share with our readers the extraordinary life and spiritual journey of a Saint, Her Holiness Mrs. Yoya Vallee. From being hearing and speech impaired since childhood, to pursuing a career as an international model and an artist, to having spiritual distress caused by negative energies and ultimately giving everything up to practice Spirituality, H.H. Yoya’s life is an example of how God graces seekers with spiritual growth, if they have intense spiritual desire, and strive to undertake regular spiritual practice despite all obstacles. In another article, we showcased H.H. Yoya Vallee earlier in her spiritual journey as a subtle-artist and member of the spiritual research team at SSRF. In this article, we are grateful to present to society, the aspect of her spiritual journey from seeker to Sainthood. At the time of compiling this article (October 2014), H.H. Yoya’s spiritual level is 72%. At the spiritual level of 70% one attains Sainthood. We have segmented this article into various sections that we feel will be useful to a seeker of Spirituality. We pray that it will inspire seekers to make efforts towards growing spiritually. H.H. Yoya Vallee was born in 1980 in Belgrade, Serbia. Through spiritual research, we found she was born from the higher region of Heaven which is known as Uccharswargalok in the Sanskrit language. At birth itself, her spiritual level was 50%. During her early years however, her spiritual level dropped to 40%. Note from the editor: This can happen to people born from a higher plane of existence in the Universe. The reason for the drop in spiritual level is due to the destiny that they undergo and as there is generally a gap in time before they commence spiritual practice in their current lifetime. Yet owing to the strength of spiritual practice done in previous lifetimes, they are able to achieve rapid spiritual progress in their current birth. Here are a few pictures from her early years. To read more about H.H. Yoya’s early years and modelling career do read the article about her as an artist of drawings based on subtle-knowledge. H.H. Yoya has a severe hearing disability, but she did not let this affect her spiritual journey. Eventually, her hearing and speech improved as an outcome of her spiritual practice. When H.H. Yoya was 10 months old, she developed a middle ear infection in both her ears. This later escalated into bilateral mastoiditis and so she had to undergo bilateral mastoidectomy. This is a procedure performed to remove the mastoid air cells. However, she developed an almost 100% hearing impairment due to post-surgical complications. H.H. Yoya and her mother, Mrs Dragana Kislovski, took initial steps to overcome her hearing disability. Regarding this, H.H. Yoya recollects, “My hearing impairment delayed my ability to learn to talk. When I was about 1-2 years old, I would make efforts to utter some words, but it would only result in lip movement devoid of sound. Painstakingly, my mother taught me to say ‘Mama’. Later, although I was hardly able to hear anything, I began to comprehend the speech of a person a couple of meters away, by learning to lip-read.” Later at the age of 16, H.H. Yoya ventured into the world of high fashion as a model, but this came with its own challenges. Fashion shows are accompanied by music and models have to be on cue to the beat; the challenge was that H.H. Yoya could hear nothing. H.H. Yoya recalls, “As a result, my preparations and training in modelling were challenging tasks. While in Tokyo, the Japanese were puzzled that I could model despite my hearing impairment, yet they still gave me a chance. At my first fashion show in Tokyo, there was a thunderous applause from the audience. That truly marked the beginning of my modelling career.” H.H. Yoya always maintained a positive outlook. She did not allow her hearing impairment to deter her from her everyday life and, later, her spiritual practice. When she was 15 years old, her mother was amazed when H.H. Yoya told her mother that being hearing impaired is her destiny and that she will accept it. Note from the editor: In fact the quality of acceptance and not giving into obstacles has been one of the hallmarks of H.H. Yoya’s spiritual journey. 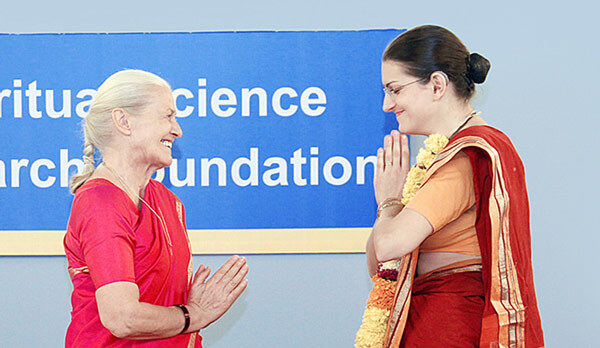 After commencing spiritual practice, the blessings of His Holiness Dr. Athavale and several Saints brought about astounding improvement in her hearing and speech. We asked H.H. Yoya to tell us more about this. She said, “In August 1999, while I was in Atlanta, USA, H.H. Dr. Athavale informed me that my hearing and speech ability would improve by 30% if I practiced Spirituality regularly. From October 1998, prior to going to India itself, I began to chant six rounds of a rosary, each for the chants ‘Hail Jesus’ and ‘Shrī Gurudev Datta’. My speech showed slight improvement. By the time I visited India in December 1999, my speech had improved to a great extent. “On 2nd January 2000, I visited H.H. Bhau Masurkar, an Indian Saint from Sindhudurg, in Maharashtra, India who has mastery over the Science of Numerology. When He spoke, I was able to hear Him clearly for a few seconds. I was stunned and burst out crying. This was the very first time that I was able to hear so clearly and it repeated for a few times thereafter. “In June 2001, I went to pay obeisance to a Saint from Mumbai in India, H.H. Joshibaba who had attained mastery on nullifying spiritually distressing energies. He gave a remedy for my speech improvement. The treatment was at the spiritual level and was thus beyond the comprehension of the intellect. It was a ritual that required putting a teaspoonful of burnt jaggery on a small wooden board and licking it. H.H. Joshibaba performed a ritual subtly and blessed the board before giving it to me. Over the years to come, my speech improved considerably. Now, in 2014, it is comprehensible to everyone without much effort on their part. This improvement has occurred without resorting to treatment from any physician.” In 2014, H.H. Yoya says that her ability to hear has improved from 0% to 10%, and her ability to speak from 30% to 80%. This progress in especially her speech defies any rational explanation. The doctors that would treat her are amazed. Note from the editor: H.H. Yoya has had a severe hearing disability, but she did not let this affect her spiritual journey. Eventually, her hearing and speech improved as an outcome of her spiritual practice. This experience gave her more faith in spiritual practice. Instead of being happy with this and resting on her laurels, she invested her full effort into attaining spiritual growth. First satsang of H.H. Yoya Vallee with H.H. Dr Athavale on 24 December 1999 in Goa. H.H. 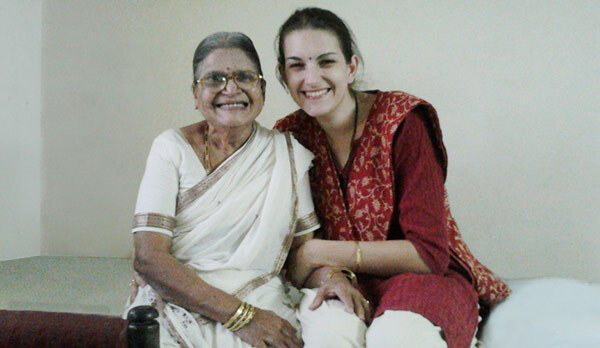 Yoya Vallee with H.H Anuradha Wadekar. H.H. Yoya Vallee with H.H. Anjali Gadgil in 2013. H.H. Yoya Vallee with H.H. Lola Vezelić in 2013. H.H. Yoya Vallee with H.H. Ashalata Sakhdev. H.H Yoya Vallee, H.H. 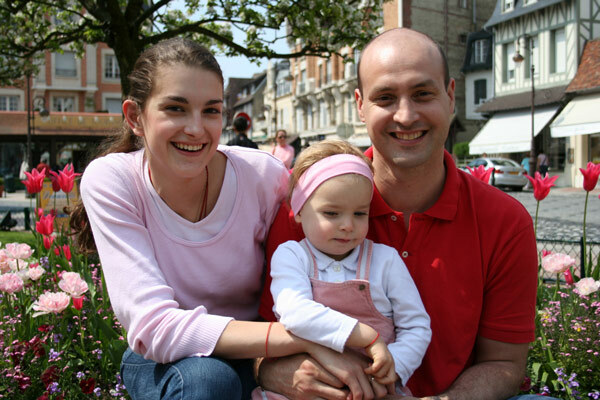 Cyriaque Vallee and Their daughter Anastasia with H.H. Dr Athavale. H.H. Yoya Vallee with H.H. Saurabh Joshi in 2013. H.H. Yoya Vallee with H.H. Ramanand Maharaj and H.H. Dr Athavale. H.H. Yoya Vallee showing a subtle-drawing to H.H. Rajendra Shinde in 2011. H.H. Yoya Vallee with H.H. Das Maharaj in 2012. H.H. Yoya Vallee with H.H. Binda Singbal in 2013. H.H. Yoya’s spiritual and life journey has been blessed with having a wonderful spiritual partnership and marriage to H.H. Cyriaque Vallee. They have supported each other on each other’s spiritual journey and they both attained Sainthood in 2013. Note from the editor: It is rare indeed in the era of Kaliyug to have both husband and wife committed equally to spiritual practice. It is even rarer for both husband and wife to reach Sainthood. H.H. Yoya tells us about how they met, “In 1998, a week prior to my 18th birthday, I visited a discotheque in Tokyo, Japan, along with some friends from the fashion industry. While dancing, I glanced at a young man’s eyes. I felt as if I knew him before. We got into a conversation mainly about art and a little about God. He felt that he could easily understand all my drawings which I showed him later. This was how our relationship began. “Once when we visited a park, I had a strong feeling of God’s presence there. During that visit Cyriaque momentarily saw light shining in and around me, though at the time, he remained silent and did not mention it to me. Later I took him home and introduced him to my mother. Cyriaque spent 3 hours at our place engrossed in a spiritual conversation with my mother. After he left, I told my mother of my desire to get married to him. My mother was happy as she felt that I was sure about Cyriaque and found him to be a good person. “Often the two of us had to separate due to modelling engagements in different parts of the world. I toured Milan, Italy on assignments and Cyriaque returned to France but we tried not to stay apart for too long. Eight months later, in February 1999, when I went to Milan in connection with another modelling assignment, Cyriaque accompanied me. As he was afflicted at the time with problems due to departed ancestors’ spirits, he had been advised to chant ‘Shri Gurudev Datta’ which is a protection chant. While he chanted this, I would see through sixth sense of vision some distressing energy around him; but I was not afraid of it. In fact, I made a drawing through subtle-vision illustrating the mechanism of action of pleasant and distressing energies on him. The two of us travelled together extensively and gradually we fell deeply in love. H.H. Yoya Vallee and her husband H.H. Cyriaque Vallee in Paris in 1999 while they were both models. The French TV channel M6 made a documentary film about their unique love and life, which was followed by many interviewers for magazines in France and Serbia. “In November 1999, Cyriaque proposed to me in Tokyo. During that time, once while I was chanting ‘Hail Jesus’ I saw a vision of my marriage to Cyriaque. I also had an intense desire to meet H.H. Dr. Athavale and wished to get married in His presence. Both Cyriaque and I were contemplating on getting married by having a Vedic wedding ceremony as we felt a lot of spiritual positivity from the ritual. So we asked Mrs. Sharon Clarke Sequeira, a seeker who guided us spiritually at that time and who was in touch with H.H. Dr. Athavale about whether we could get married in a Vedic ceremony. The response that we received made our life shine with new light. H.H. Dr. Athavale invited us to India and even said that all arrangements for our wedding would be made by seekers in India. 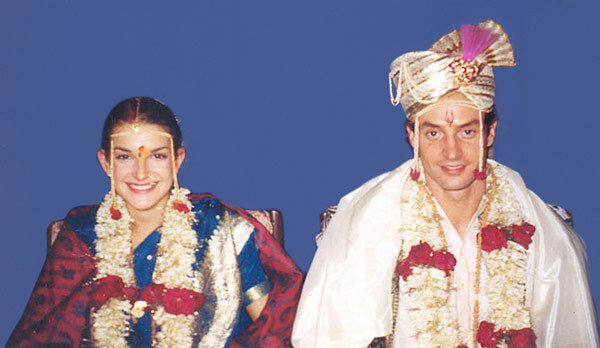 “On 24th December 1999, we arrived in India with my mother and Mr. Mahesh Mehta, a seeker, accompanied us by train to Goa where the wedding was to take place. I felt extremely pleasant when I met H.H. Dr. Athavale for the very first time. That evening after H.H. 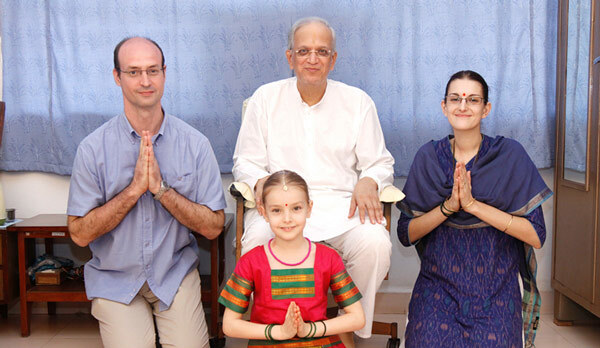 Dr. Athavale’s guidance, when I paid obeisance at His feet I experienced a Blissful state. Our Vedic wedding was scheduled for the next day. “In August of 2000, Cyriaque and I had a civil marriage in Nice (France), in the presence of our families. We had started understanding how the time we had spent with H.H. Dr. Athavale had been invaluable for us and that it had positively impacted us at many levels.” As a result both of them started experiencing spiritual growth and developed a deeper sense of living Spirituality and growing towards being a ‘model couple’ in a spiritual sense. In an earlier article, we have elaborated on H.H. Yoya’s talent for drawing shown early in her life and the initial steps of drawing the spiritual dimension as a medium. In this section, we explore H.H. Yoya’s transition from being an artist, to a medium and then finally to a subtle-artist drawing for God-realisation. In her younger days, H.H. 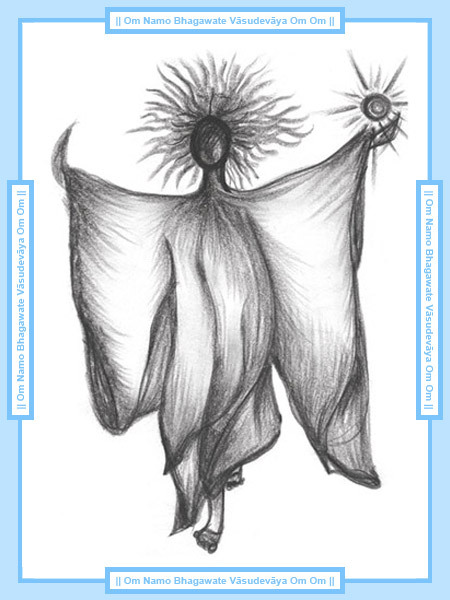 Yoya would create drawings on various topics ranging from angels, to family life and love. She drew mostly from an artistic point of view. She would sketch anything which would give her joy. This drawing below is an abstract drawing she drew on 8 Nov. 1998 named ‘Mother and Daughter’. 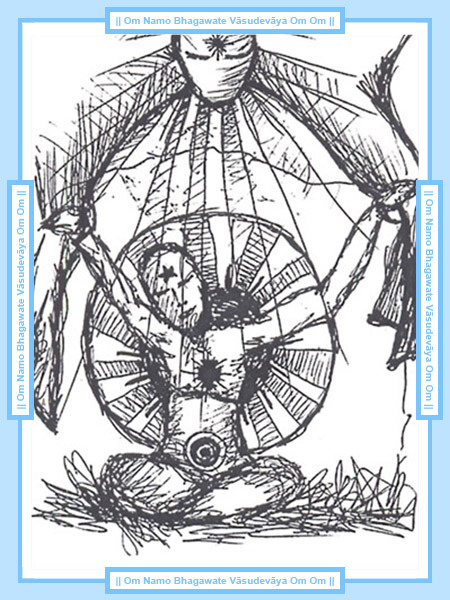 On 13 May 1998 in Tokyo in another drawing (shown below) she drew her experience of feeling the presence of Divinity with her to-be-husband (now H.H. Cyriaque Vallee). She named it ‘In your company, I can experience God’. However these drawings were mainly limited to art as per worldly terms. They did not aid H.H. Yoya much in her spiritual growth. Then, at around the same time, unknown to H.H. Yoya, subtle-entities began to use her skill as an artist to project their own art forms. H.H. Yoya was becoming a medium for these subtle-entities. At that time, H.H. Yoya could not discern that the drawings she was creating were actually emitting negative vibrations. Lower level subtle-entities and negative energies often use people who have some sixth sense ability to perceive the spiritual dimension to further their own desires and goals. Below we have given an example of two such drawings drawn by her as a medium. 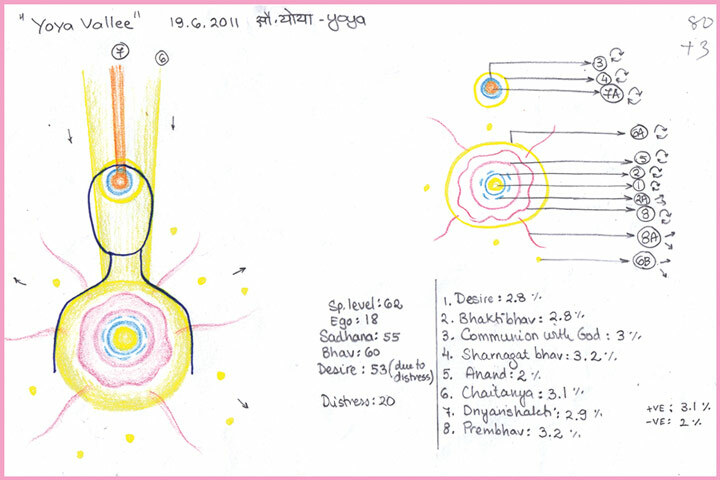 The drawing below made on 12 Sept. 98 is called ‘Experiencing Spiritual energy and Bliss’. The next drawing shown below was supposedly meant to display a positive spiritual connotation but emitted high spiritual distress. Almost all her drawings created as a medium emitted distressing vibrations. You can see what you feel while looking at the two drawings above. From time to time during that period, she would have intense thoughts and see visions. She would draw both negative and positive images. However she recalls that often after drawing, it would leave her drained and deflated. She never really understood the reason for this. It was only when she met H.H. Dr. Athavale that she began to understand what was actually happening. He explained also how drawing as a medium can be detrimental as one can be influenced by negative energies and one’s spiritual energy can become depleted as well. Sometimes we can get an illusory feeling that the drawing is positive, but this is an illusion created by negative energies. When seeing the drawing through sixth sense, such drawings emit negativity. Such drawings may look appealing and even be known as trend setters, but in actuality negative energies use such drawings to affect an unsuspecting viewer of art with distressing spiritual vibrations. In fact, H.H. Dr. Athavale guided H.H. Yoya that she stop drawing for over a year and resist any urge to draw in order to get out of the clutches of subtle-entities who were using her as a medium. Even though it was sometimes difficult to resist the urge, H.H. Yoya obeyed H.H. 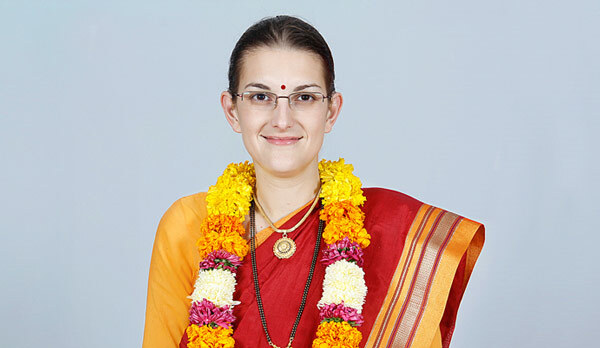 Dr. Athavale and instead started spiritual practice of chanting God’s Name in earnest. Note from the editor: This ability to obey and listen to a spiritual authority and leave her wants aside when she was just starting her spiritual journey is testimony to the innate seekership qualities that H.H. Yoya had. After a period of about a year, H.H. Dr. Athavale allowed her to start drawing again. The difference this time around was that her abilities as a subtle-artist were underpinned with regular spiritual practice and the guidance of H.H. 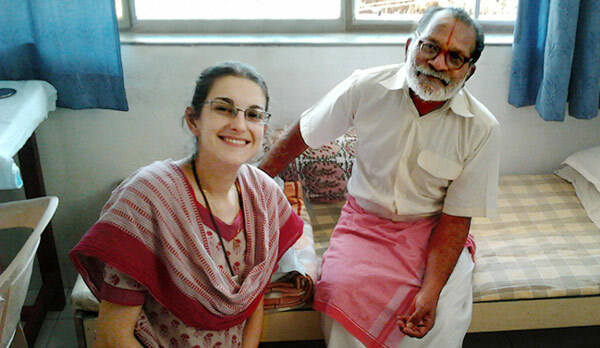 Dr. Athavale who is a Parātpar Guru. Thus, from the year 2000 onwards, H.H. Yoya experienced a transformation in her drawings that took her sixth sense and her ability to see the subtle to progressively higher levels. The accuracy of her drawings based on subtle-knowledge in representing the spiritual dimension and all its subtleties steadily kept increasing as she persisted with her spiritual practice under the guidance of H.H. Dr. Athavale. At the Spiritual Research Centre, drawings submitted by subtle-artists are checked by H.H. Dr. Athavale. They are scored in percentage terms, which is dependent on how accurately the subtle-vision of the artist represents what exactly is taking place in the spiritual dimension. The factors considered is the ability to see subtler spiritual vibrations, ability to perceive illusory vibrations and not be taken in by it, the ability to accurately present colour, etc. At SSRF, drawings based on subtle-vision need to have a minimum score of 40% in order to be considered for publishing. The scores for an average subtle-artist in the world range between 5 to 9%. It is making drawings based on her sixth sense of vision that has taken H.H. Yoya ahead in Spirituality through the spiritual Path of Knowledge (Dnyanyoga). She studies all the Divine knowledge she receives while drawing and documents it on each drawing. The accuracy of her being able to perceive the spiritual dimension through her sixth sense of vision gradually increased from 20% to 80% and on a few occasions has even reached 90%. 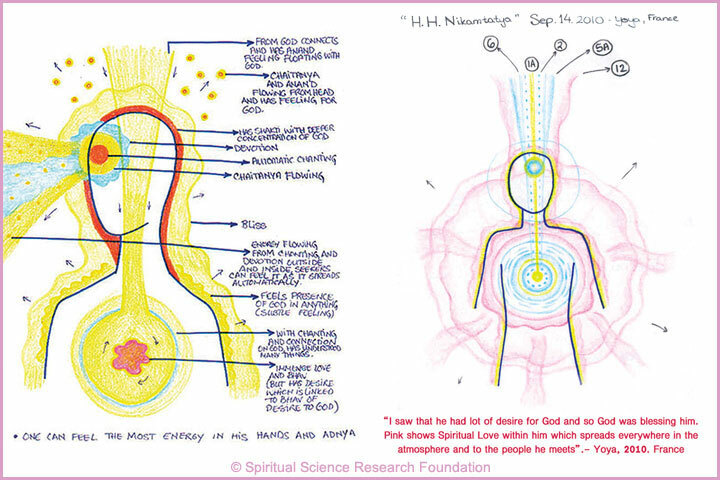 At SSRF, subtle-artists only draw topics as their spiritual practice under the guidance of H.H. Dr. Athavale, and not due to their personal inclination. Transformation in H.H. Yoya Vallee’s subtle-drawings from 20% accuracy to 90% accuracy In the slideshow below, we have displayed samples of H.H. Yoya’s drawings based on subtle-knowledge that range from 40% to 90% accuracy. In each subtle-drawing we have covered a new aspect of detail or complexity that H.H. Yoya has been able to perceive about the spiritual dimension. 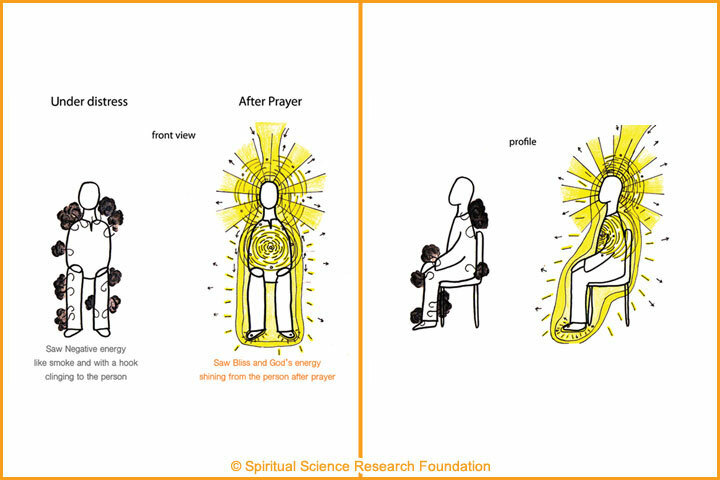 In this drawing based on subtle-knowledge about the effect of prayer on a seeker having spiritual distress, H.H. Yoya is able to see the grossly different vibrations but not different colours – only positive and negative. 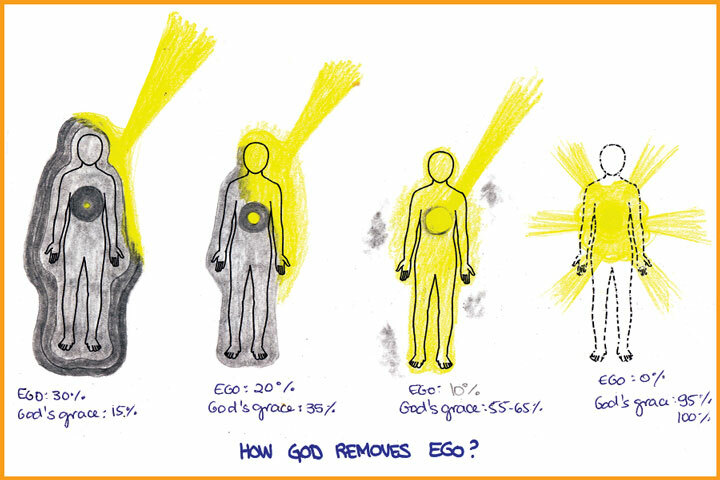 How God reduces the ego of a person in their spiritual journey is displayed in this drawing based on subtle-knowledge. The highlight of this subtle-drawing is that H.H. Yoya is able to see the progression of the subtle-process. She is also able to give relative percentages of each step in the process. Another aspect is that she was able to visualise the entire process without having any person as a reference. A subtle experiment was conducted using a pendulum to measure the distance up to which vibrations were emitting from H.H. Dr Athavale. The dowser was H.H. Lola Vezilic. Even though H.H. Lola held the pendulum 4 floors (approx. 30 metres above H.H. Dr Athavale, the pendulum continue to move in a clockwise direction. 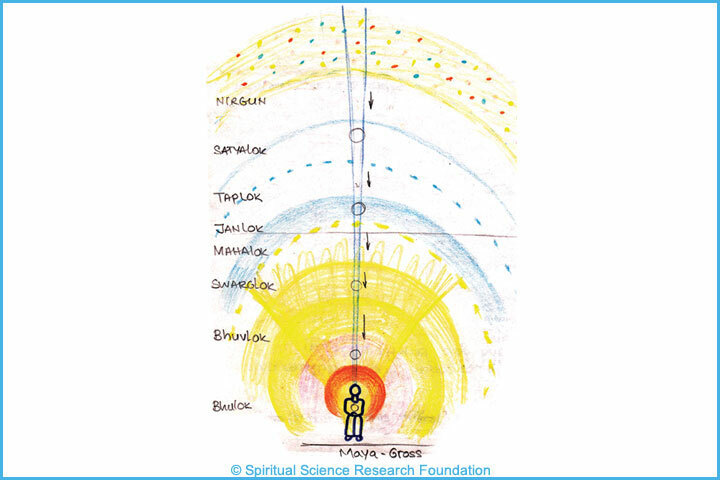 H.H Yoya was able to see and experience the different higher subtle positive planes of the universe and the unique colours associated with them up to the unmanifest or Nirgun Principle of God. She also saw that the vibrations emitting from H.H. 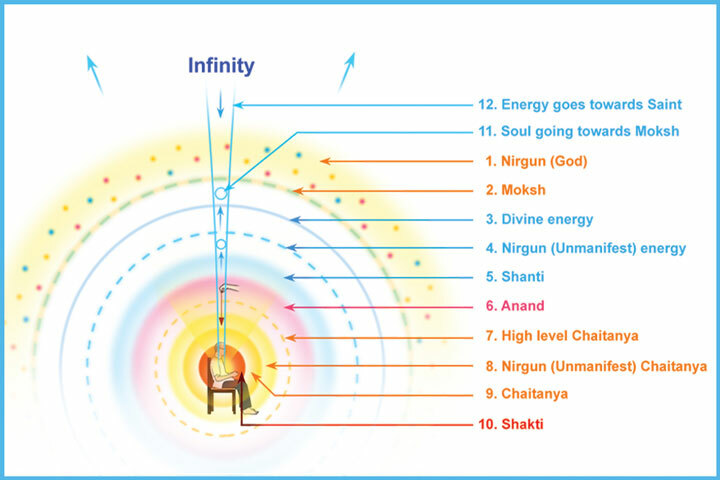 Dr Athavale travelled into infinity into the various positive regions of the Universe and then from the Universe she saw vibrations returning back to Him. Om is also called the Pranav mantra (that mantra which bestows Absoluteness). Spiritual research about Om has revealed that by nature Om rests only after imparting Absoluteness. It gives energy for Creation, Sustenance and Dissolution. It has no beginning and no end. Even though H.H. Yoya cannot hear the sound as she is hearing impaired, she can still feel the spiritual vibrations that it emits. 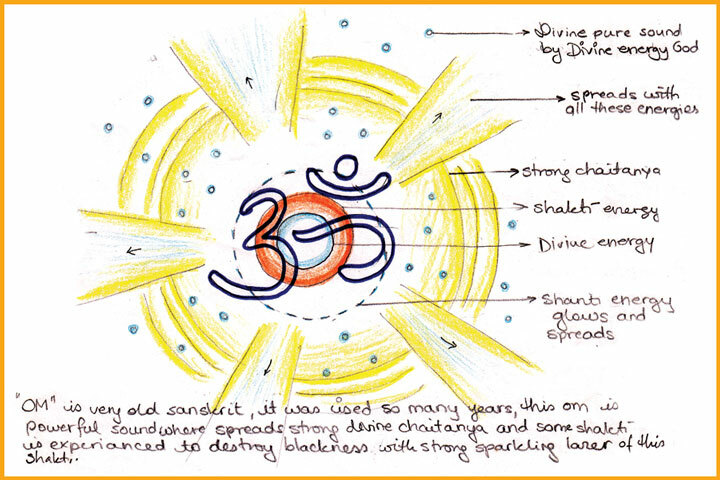 The highlight of this drawing is that along with what H.H Yoya saw she was also able to obtain subtle-knowledge about the Om symbol. In this drawing based on subtle-knowledge, H.H. 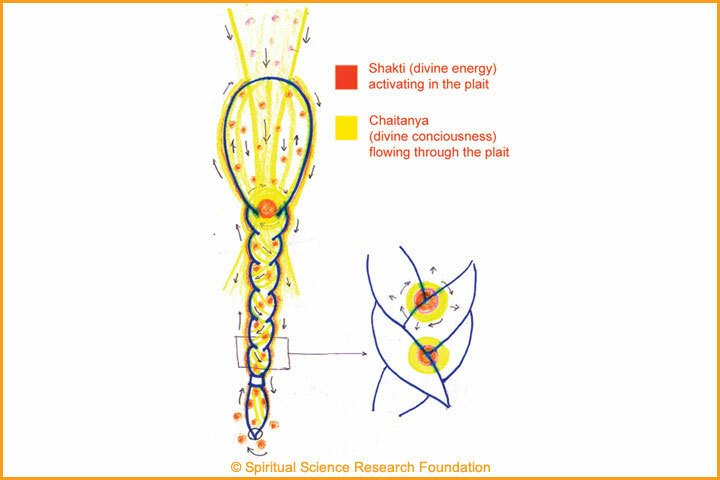 Yoya demonstrated her ability to zoom into aspects of the drawing to provide further details on the flow and direction of subtle-energies. H.H. Nikam Tatya is a Saint from Maharastra who is blind. Even though H.H. Yoya has never met Him, just from a picture she was able to visualise the various positive subtle vibrations around him. 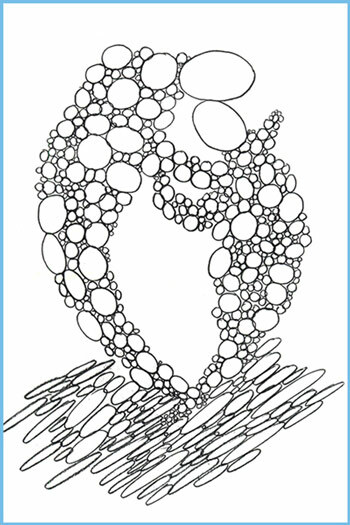 The first drawing based on subtle-knowledge was drawn in 2007 where the accuracy was 70% and the second one was drawn in 2010 where she was able to attain 90% accuracy. The difference between the two pictures is the level of detail and accuracy of positive vibrations she could perceive. Having visions of the future H.H. Yoya sometimes would be able to perceive what was going to happen in the future. This drawing was based on a vision that she had about H.H. 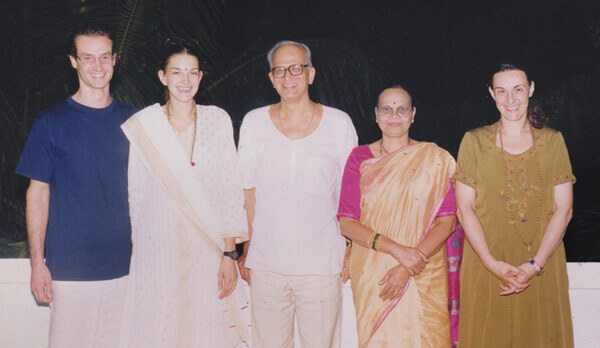 Dr. Athavale and the Spiritual Research Centre many years ago when she was in France. 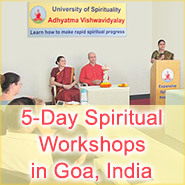 At that time, the Spiritual Research Centre and Ashram in Goa was not even constructed. 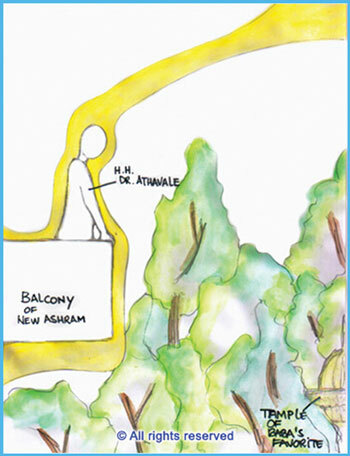 The balcony shown in the drawing looks exactly like the balcony of H.H. Dr. Athavale’s room as it stands today with trees around and with a famous temple nearby. “From late 1999, H.H. Dr. Athavale guided me on the art of drawing. He explained to me how I could use my talent for drawing for the mission of spreading Spirituality, so that people would experience a Divine feeling when they saw the drawings. He further told me that spiritual energy in a seeker should destroy the impressions in the mind so that it becomes blank. When all the impressions in the mind are destroyed, that is when God’s energy manifests from within. It is only then that one acquires God’s knowledge, energy, talent and all His other qualities. “Now, when I make drawings based on subtle-knowledge, it is a process of concentration. Only when I concentrate does the drawing attain perfection”, says H.H. Yoya. We have received comments from many readers in our Login facility, about how the drawings of H.H. Yoya have influenced them positively to start spiritual practice. Along with that, whenever we show these drawings in SSRF lectures or satsangs, they make a great impact on the attendees as per the old adage that ‘a picture is worth a thousand words.’ H.H. Yoya Vallee has inspired many seekers with her drawings based on subtle-knowledge. Discussing H.H. Yoya’s spiritual journey without expanding on the spiritual distress she experienced would be like telling only half the story. From birth itself, H.H. Yoya was possessed by a higher level negative energy known as a subtle-sorcerer (māntrik). However this spiritual distress was only diagnosed when she started spiritual practice. Note from the editor: Generally, people are unaware of any entity that may be possessing them. It is only when they start spiritual practice does the negative energy manifest. This is because the possessing entity cannot tolerate the spiritual purity obtained by the seeker through regular spiritual practice. For years, H.H. Yoya was severely affected by the negative energy and her daily life would be badly compromised by it. For example, she would suddenly feel dizzy, writhe on the floor and become unconscious due to the possessing entity and not because of any physical reasons. She would from time to time be consumed by negative thoughts due to the possessing entity. Both her family life and spiritual practice was obstructed by the possessing entity. When she drew negative energies affecting seekers as part of her spiritual practice, she would actually see their scary form through her subtle-vision. Here, too, she would be affected by negative energies trying to obstruct her from drawing them. H.H. Yoya through this entire period tried to maintain a positive attitude and she says, “I used to have a lot of spiritual distress. It was not easy for me, but I felt that I should accept whatever is happening because whatever situation God was placing me in was good to develop something in me.” It was largely due to her inner desire, the kindness and understanding she received from her husband, H.H. Cyriaque, and the grace of H.H. Dr. Athavale that she was able to persevere and overcome the distress. Today, H.H. Yoya is free from negative energy distress. While they were in France, despite the obstacles of negative energies, H.H. Yoya’s and H.H. Cyriaque’s efforts for spiritual practice were commended by H.H. Dr. Athavale when they both attained a spiritual level of 62%. In one instance, H.H. Yoya recalls how she gave up watching television and gave away their television set when she realised that watching TV could increase Raja-Tama vibrations in the environment and that current TV programming was spiritually harmful for her. “Earlier I used to watch a lot of TV,” she recounts, “but then I realised that I would experience spiritual distress after watching TV, and that my mind was being fooled into thinking it was entertaining. I would lose awareness of time after watching TV. I wouldn’t know what I needed to do next. 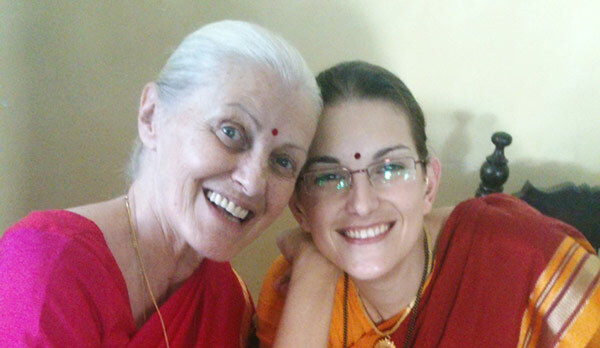 I realised that when I do something to serve God (satsēvā), I experience much more joy.” With the birth of their daughter, Anastasia, their life entered a new phase. Raising a child while being deaf and experiencing severe spiritual distress was not easy for H.H. Yoya. She would feel fear that if she could not hear Anastasia crying, then how could she tend to her? However, by increasing her faith in God accompanied by auto-suggestions, she was able to overcome her emotional nature and fears about Anastasia. She would take care to instill the need to chant within Anastasia and also told her spiritual stories of Saints. H.H. Yoya’s and H.H. 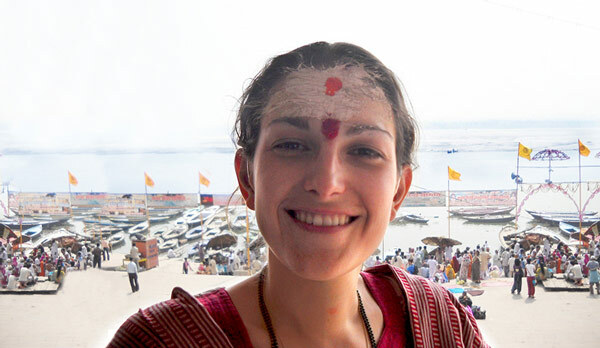 Cyriaque’s decision to sacrifice their lifestyle in 2011 and shift completely to the Ashram in India where the Spiritual Research Centre is located was a challenging one. With the aim of God-realisation firmly etched in their mind, from a life of comfort and material prosperity, they felt that living a simple life in an ashram would boost their spiritual practice. In preparation they had initially discarded most of their belongings and had shifted whatever was left to Serbia from France in one carload. A few months later, together with their 6 year-old daughter Anastasia, they packed their entire life into three suitcases and headed for India. Note from the editor: Letting go of attachments towards worldly life always comes with some amount of fear for the future. In the case of seekers with spiritual distress, negative energies take advantage of the situation by multiplying the emotions. However, if a seeker’s desire for spiritual growth is genuine, then God always comes to help a seeker through a situation so as not to obstruct their spiritual practice. In actuality, this initial turbulence was like a stepping stone to a period of spiritual upliftment. 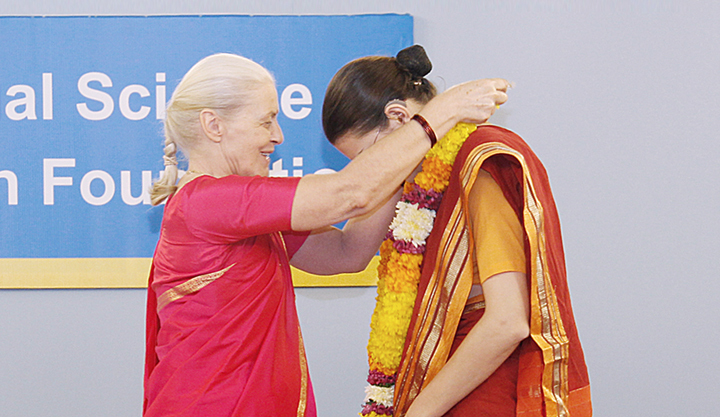 Within a little over a year after their arriving in the Ashram, their spiritual level increased to 66%. In the Ashram and Spiritual Research Centre many of their spiritual virtues were noticed by others. H.H. Yoya naturally assimilated various aspects of a spiritual lifestyle. Her love for others increased a lot and everyone around her would feel it. When H.H. Yoya speaks, it is impossible not to smile and her child-like innocence is experienced when listening to her. When other seekers progress or are praised for their efforts, she experiences so much joy for them that she is not able to contain it. Anything that H.H. Yoya learns from other seekers, she tries to put it into practice immediately. She also has a very good asking attitude and asks seekers to tell her if she is doing something correctly or not, and is accepting and open to their feedback. She also has a lot of curiosity and asks questions about any new thing that she learns. H.H. Yoya openly accepts and shares with others about where she is lacking in her spiritual practice and makes conscious efforts in overcoming her defects and ego. Despite her high spiritual level and many qualities, H.H. Yoya is humble and constantly gives all credit for her actions to H.H. Dr. Athavale and God. We saved the best for last, which is H.H. Dr. Athavale’s words on the occasion of H.H. Yoya attaining Sainthood. “Yoya is hearing impaired and thus speaks in a specific way. She also has severe distress of negative energies. Twenty-three years of her life were spent under the influence of western culture. She was in the modelling profession which is Raja-Tama predominant. Despite all these aspects, the progress which she has made is stunning. Yoya has placed before all others an ideal, about how one can overcome all obstacles and attain progress if one has yearning. It is surprising that after realising the importance of spiritual practice and keeping only one goal of God-realisation in front of them, she and her husband swiftly sacrificed their body, mind and wealth. Hence, merely at the age of 32 years, Yoya has progressed to such a high spiritual level. As H.H. Dr. Athavale has stated one of the qualities of H.H. Yoya is that she is able to analyse herself objectively through subtle-knowledge. H.H. Dr. Athavale had requested H.H. Yoya to create a drawing based on subtle-knowledge of herself. Even though it is very difficult to analyse oneself objectively, H.H. Yoya was able to do it and we have displayed the subtle-drawing below. Despite various struggles, such as initially having to overcome her hearing disability and later, distress from negative energies, yet it was her natural purity, seekership and devotion that have taken her to great spiritual heights. For seekers on their spiritual journey who are facing obstacles, they can take courage from remembering H.H. Yoya’s example. How she overcame obstacles of speech and hearing impairment and severe demonic possession to persevere with spiritual practice to reach Sainthood. God knows each of our situations and the difficulties that we face. When in spite of our trials and tribulations, we show our desire by taking one step towards Him by practicing Spirituality, He helps us by taking 10 steps towards us. We wish you the best in your spiritual journey. 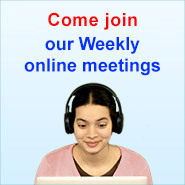 If you have any questions please contact us through the question and answer menu in the login facility.